The energy drinks industry comprises beverages such as energy drinks, energy shots and energy drink mixes. Energy drinks are known as beverages that promise to give the consumer an extra energy boost. They are typically high in caffeine and contain additional ingredients including taurine, guarana and B vitamins. Energy shots are a more concentrated form of energy drinks and contain a larger amount of the primary ingredient caffeine. Energy drink mixes as the third subcategory come packaged as powder and may be mixed with water or juice. 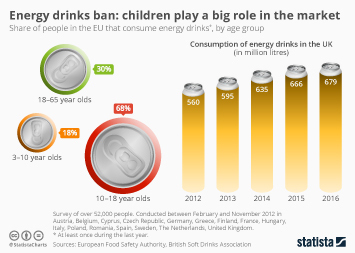 Energy drinks are assumed to be quite popular among younger age groups who mostly consume energy drinks to wake up or stay awake, increase their mental performance or to enable them to concentrate longer. The latest statistics illustrate that energy drink sales amounted to 2.8 billion U.S. dollars in 2016. Due to a high market growth potential, dollar sales have consistently increased since 2011. According to well-known industry sources, energy drinks reported a volume sales growth of 5.13 percent in 2016 compared to a year ago. The U.S. energy drink market is mainly dominated by key players such as Red Bull, Monster Beverage and Rockstar, based on 2016 sales. Red Bull generated U.S. sales worth of 3 billion U.S. dollars with its energy drink that "gives you wings" in that year. Monster Energy reported sales of 1.5 billion U.S. dollars. According to a recent consumer survey, about 47 percent of respondents indicated to consume energy drinks several times per week. When buying energy drinks, supermarkets and general merchandisers as well as convenience stores and gas stations seemed to be the predominant distribution channels. The energy drink brand itself, the taste, and an affordable price were cited as important product attributes. Sales volume of liquid refreshment beverages in the U.S.
More interesting topics from the industry "Soft Drinks"